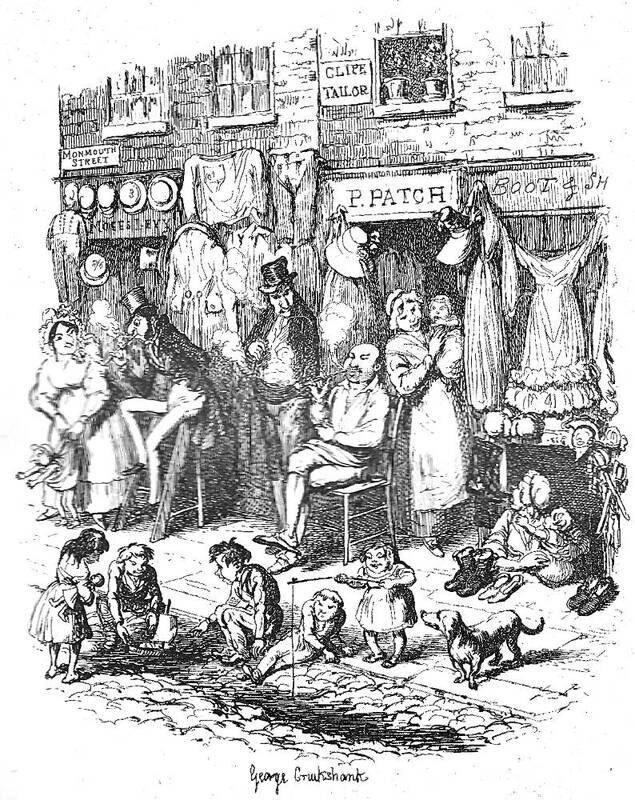 "London Recreations" — Cruikshank's ninth illustration for Dickens's "Sketches by Boz" (Second Series), Chapter 9 in "Scenes." "London Recreations" — the ninth chapter in "Scenes," by Charles Dickens in Sketches by Boz, facing p. 67. Let us turn now, to another portion of the London population, whose recreations present about as strong a contrast as can well be conceived — we mean the Sunday pleasurers; and let us beg our readers to imagine themselves stationed by our side in some well-known rural "Tea-gardens." The heat is intense this afternoon, and the people, of whom there are additional parties arriving every moment, look as warm as the tables which have been recently painted, and have the appearance of being red-hot. What a dust and noise! Men and women — boys and girls — sweethearts and married people — babies in arms, and children in chaises — pipes and shrimps​— cigars and periwinkles — tea and tobacco. Gentlemen, in alarming​waistcoats, and steel watch-guards, promenading about, three abreast, with surprising​dignity (or as the gentleman in the next box facetiously observes, "cutting it uncommon​ fat!") — ladies, with great, long, white pocket-handkerchiefs like small​table-cloths, in their hands, chasing one another on the grass in the most playful and​interesting manner, with the view of attracting the attention of the aforesaid gentlemen​— husbands in perspective ordering bottles of ginger-beer for the objects of their​affections, with a lavish disregard of expense; and the said objects washing down huge​ quantities of "shrimps" and "winkles," with an equal disregard of their own bodily health​ and subsequent comfort — boys, with great silk hats just balanced on the top of​their heads, smoking cigars, and trying to look as if they liked them — gentlemen​ in pink shirts and blue waistcoats, occasionally upsetting either themselves, or somebody​else, with their own canes. Some of the finery of these people provokes a smile, but they are all clean, and happy, and disposed to be good-natured and sociable. Those two motherly-looking​women in the smart pelisses, who are chatting so confidentially, inserting a "ma'am" at​every fourth word, scraped an acquaintance about a quarter of an hour ago: it originated​in admiration of the little boy who belongs to one of them — that diminutive​ specimen of mortality in the three-cornered pink satin hat with black feathers. The two​men in the blue coats and drab trousers, who are walking up and down, smoking their​pipes, are their husbands. The party in the opposite box are a pretty fair specimen of the​generality of the visitors. These are the father and mother, and old grandmother: a young​man and woman, and an individual addressed by the euphonious title of "Uncle Bill," who​is evidently the wit of the party. They have some half-dozen children with them, but it is​scarcely necessary to notice the fact, for that is a matter of course here. Every woman in​"the gardens," who has been married for any length of time, must have had twins on two​ or three occasions; it is impossible to account for the extent of juvenile population in any​ other way. Observe the inexpressible delight of the old grandmother, at Uncle Bill's​ ​ splendid joke of "tea for four: bread-and-butter for forty;" and the loud explosion of mirth​which follows his wafering a paper "pigtail" on the waiter's collar. The young man is​ ​ evidently "keeping company" with Uncle Bill's niece: and Uncle Bill's hints — such​ ​ as "Don't forget me at the dinner, you know," "I shall look out for the cake, Sally," "I'll be​ godfather to your first — wager it's a boy," and so forth, are equally embarrassing​to the young people, and delightful to the elder ones. As to the old grandmother, she is in​ perfect ecstasies, and does nothing but laugh herself into fits of coughing, until they have finished the "gin-and-water warm with," of which Uncle Bill ordered "glasses round" after tea, "just to keep the night air out, and to do it up comfortable and riglar arter sitch an​as-tonishing hot day!" — "Scenes," Chapter 9, "London Recreations," p. 69-71. Although hardly as animated as the night-time Greenwich​ Fair (for which the present illustration serves as both an introduction and — in its sickly bourgeois sobriety and posturing — a contrast), here Cruikshank transports the reader back into the respectable recreations and past-times of London middle classes​after an exploration of the seamier side of the great city in​ the illustrations for "Seven Dials" and "Meditations​ in Monmouth Street," sketches dating from 1835 and 1836 respectively in the Morning Chronicle. Originally published in the Evening Chronicle (17 March 1835) as "Sketches London No. 6," the sketch describes three very different garden scenes: the wealthy middle-class enjoyer of his own private gardens, directing his gardeners; the retired middle-class couple working amiably together in their garden; and finally men, women, and children on a Sunday afternoon in a London tea-garden. Cruikshank focuses on the latter, addressing not so much the descriptions of "family entertainment" as those of the male celebrants. For example, he places the "Gentlemen, in alarming​ waistcoats, and steel watch-guards, promenading about, three abreast, with surprising​ dignity" (70) just to the left of centre, emphasizing by their movements the nine males in the composition, and minimizing the significance of the women by including just five (one is a mere head in a bonnet), and including just four children of indeterminate gender. 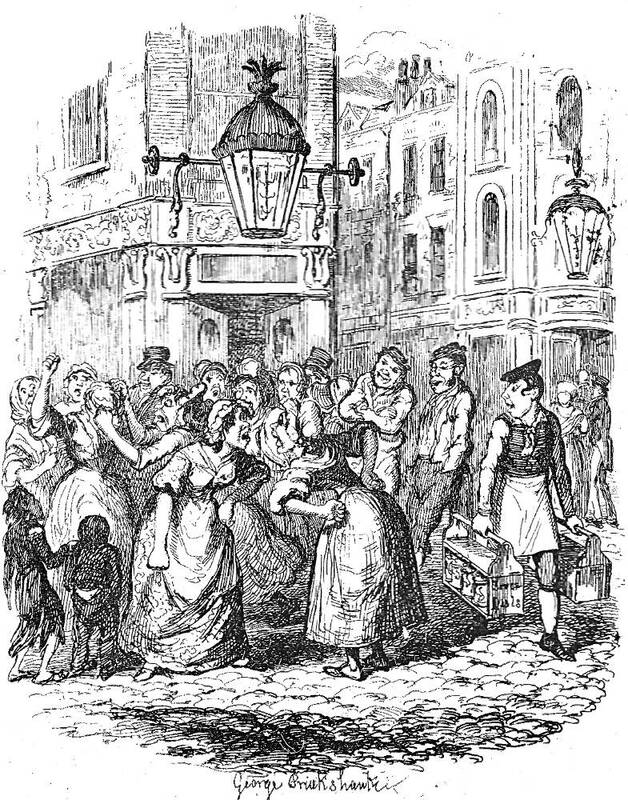 In this visual recreation of Dickens's description of Sunday afternoon family outings, the middle-class, fashionably dressed males are the dynamic figures — strolling, smoking (voluminously), and ordering beverages at the counter: there are only a few children, who merely get in the way, and whom a lone, middle-aged woman (right-hand margin) attempts to mind while her juvenile sisters run heedlessly at the left-hand margin — indeed, not at all interested in women as individuals, Cruikshank marginalizes the female presence. Then, too, the young writer (himself then a member of a large, middle-class family) sees children in specific terms such as "that diminutive​ specimen of mortality in the three-cornered pink satin hat with black feathers" (70), rather than inconvenient, generalised encumbrances busily getting under foot. Although the observant young Dickens with an eye for feminine beauty and fashion mentions "two motherly-looking​ women in the smart pelisses" (70), the illustrator does not extend his interest even to the pretty adolescents chasing one another through the grass. Nor does he bother to describe the shrimps and ginger beer, reducing the ordering of comestibles to a mere teapot and empty plates. And whatever has become of the family wit, Uncle Bill? Is he the hatless, thin, balding gentleman placing the order at the counter? Over 200 outdoor pleasure gardens and tea gardens proliferated in London from the 16th to the early 19th centuries. Primarily frequented by working class people who lived in the city, they were located in the pleasanter parts of London's suburbs. In days of yore, the countryside was only a walk (or short carriage drive or ferry ride) away from the city center. Tea and pleasure gardens afforded the populace a respite from the sights, smells, and congestion of city life. — "18th & 19th Century Pleasure and Tea Gardens in London." Jane Austen's World. As Dickens's sketch on the subject (perhaps based on the tea-gardens of one of his favourite haunts, Jack Straw's Castle, Hampstead) makes plain, the 19th century British tea-garden — perhaps one of the few entertainments available on a Sunday afternoon as a consequence of the restrictive Lord's Day Act — involved strolling around ponds and garden statues, and, of course, drinking tea. 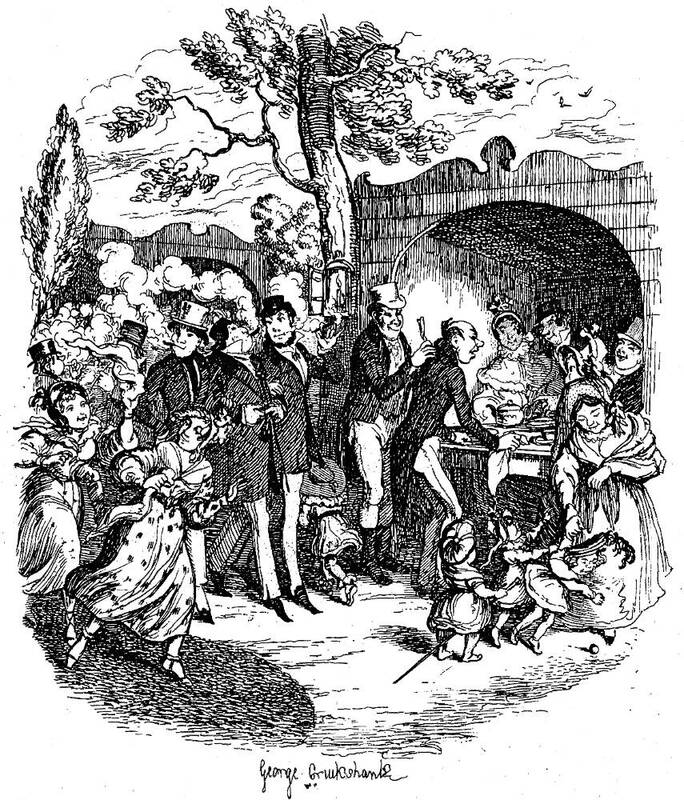 Although Cruikshank's illustration depicts a food-and-beverage bar, it does not include the kind of ornamental fish-pond evident in Harry Furniss's illustration for this particular essay, The City Man's Garden. Think of the tea-garden described by Dickens as the Vauxhall or Ranelagh Gardens for the rising middle-classes. In Chapter 46 of the Pickwick Papers (August 1837: Part 16), Dickens stages what turns out to be the arrest of ​ the litigious Mrs. Bardell (for not paying her lawyers' fees) while on excursion with her friends in the pleasure gardens at The Spaniards in Hampstead. From 1840, shortly after Dickens wrote this sketch, music and dancing were licensed at several inns with tea gardens, such as The Bell in Kilburn High Road. The character of these places have, with the habits of the people, experienced a very considerable change, and tea, formerly the chief article of consumption here, has been supplanted by liquors of a more stimulating character. At some of these, concerts, of an inferior description, are performed; and other attractions are added that generally detain the company, always of a miscellaneous character, till the approach of midnight. The following are the principal in the vicinity of the metropolis: ​ — New Bagnigge Wells, Bayswater; New Bayswater Tea Gardens; Bull and Bush, Hampstead; Camberwell Grove House; Canonbury House, Islington; Chalk Farm, Primrose Hill; Copenhagen House, Holloway Fields; Eel-pie House, or Sluice House, on the New River, near Hornsey: St. Helena Gardens, near the Lower Road, Deptford ; Highbury Barn ; Hornsey Wood House, the grounds of which include a fine wood and an extensive piece of water; Jack Straw's Castle, Hampstead Heath; Kilburn Wells, Edgeware Road; Mermaid, Hackney; Montpelier, Walworth; Mount Pleasant, Clapton; the Eagle, City Road; the Red House, Battersea Fields; Southampton Arms, Camden Town; Union Gardens, Chelsea; White Conduit House, Islington; and Yorkshire Stingo, Lisson Green. — Mogg's New Picture of London and Visitor's Guide to it Sights, 1844​; cited in Jackson. "18th & 19th Century Pleasure and Tea Gardens in London." Jane Austen's World. Posted March 1, 2009 by Vic. Accessed 27 April 2017. in Jane Austen's World. https://janeaustensworld.wordpress.com/2009/03/01/18th-amp-19th-century-pleasure-and-tea-gardens-in-london/ . Ackroyd, Peter. Dickens: A Biography. London: Sinclair-Stevenson, 1990. Bentley, Nicolas, Michael Slater, and Nina Burgis. The Dickens Index. New York and Oxford: Oxford U. P., 1990. Dickens, Charles. "London Recreations," Chapter 9 in "Scenes," Sketches by Boz. Illustrated by George Cruikshank. London: Chapman and Hall, 1839; rpt., 1890. Pp. 67-71. Dickens, Charles. "London Recreations," Chapter 9 in "Scenes," Sketches by Boz. Illustrated by Fred Barnard. The Household Edition. London: Chapman and Hall, 1876. Pp. 43-45. Dickens, Charles. "London Recreations," Chapter 9 in "Scenes," Sketches by Boz. Illustrated by Harry Furniss. The Charles Dickens Library Edition. London: Educational Book Company, 1910. Vol. 1. Pp. 86-91. Dickens, Charles, and Fred Barnard. The Dickens Souvenir Book. London: Chapman & Hall, 1912. Hawksley, Lucinda Dickens. Chapter 3, "Sketches by Boz." Dickens Bicentenary 1812-2012: Charles Dickens. San Rafael, California: Insight, 2011. Pp. 12-15. Slater, Michael. Charles Dickens: A Life Defined by Writing. New Haven and London: Yale U. P., 2009.